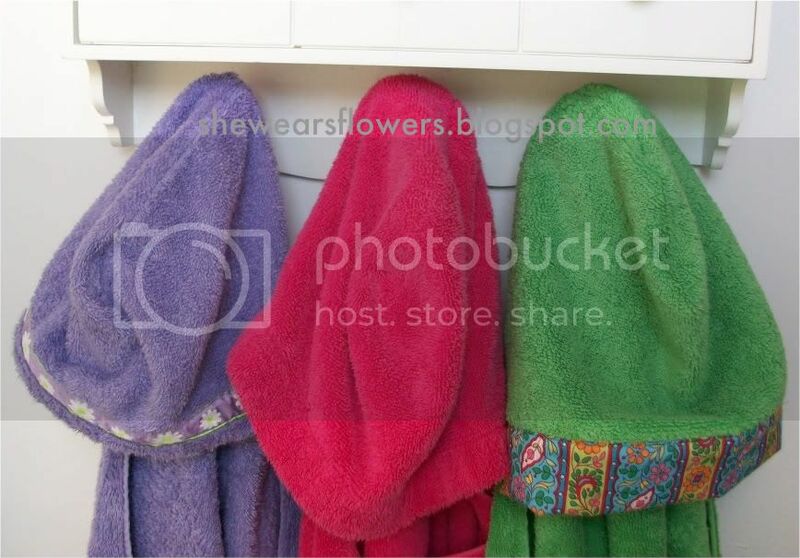 Normally, I add ribbon to the hood like the purple towel, above, or leave it alone like the hot pink towel. This time, I added fabric to the edge and made the hood a little larger while making it pretty at the same time. 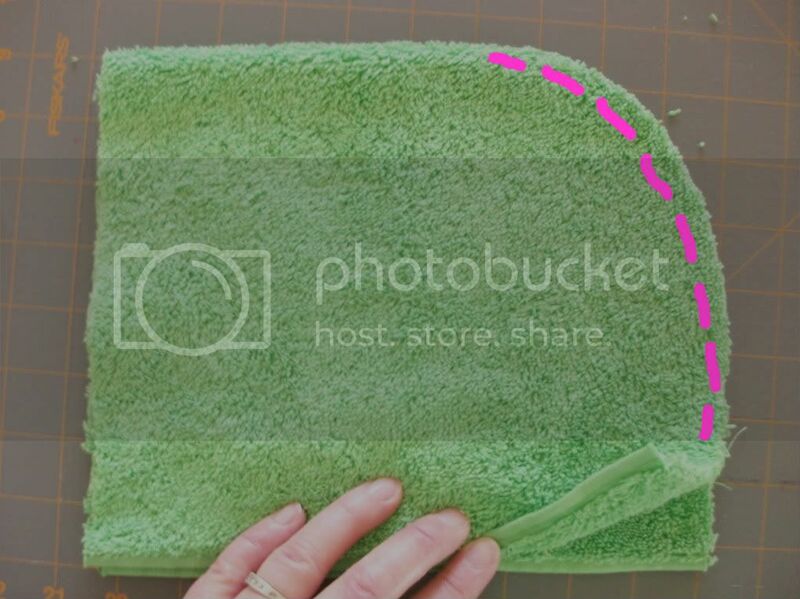 Fold the hand towel piece in half with the finished edges of the towel across the bottom. Cut one of the top corners (it's actually two pieces) off in a rounded fashion. 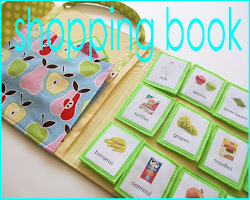 Sew along this edge making sure you back stitch at the beginning and ending points. This will be your hood. Cut a strip of fabric as long as the front of the hood (mine was about 18 inches) and about 5 inches wide. Sew it to the front of the hood. The wrong side of the fabric should be facing the right side of the hood (or the outside of the hood). 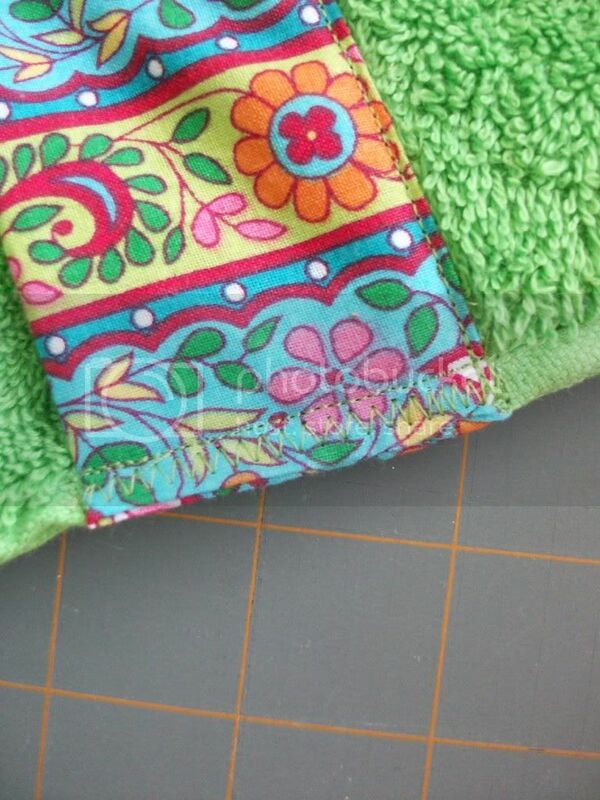 I use a pretty narrow seam because the towel is so thick it kind of pushes it there--maybe 1/4 inch. 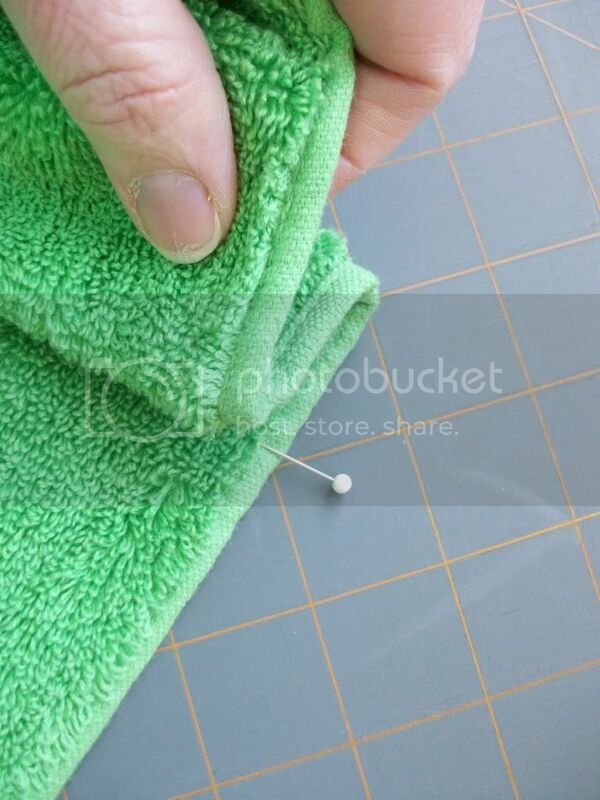 Let the edge of the fabric hang off the edge of the towel about 1/4 - 1/2 inch. Iron the edge of the fabric that is not sewn so that it is folded to the inside about 1/2 inch. 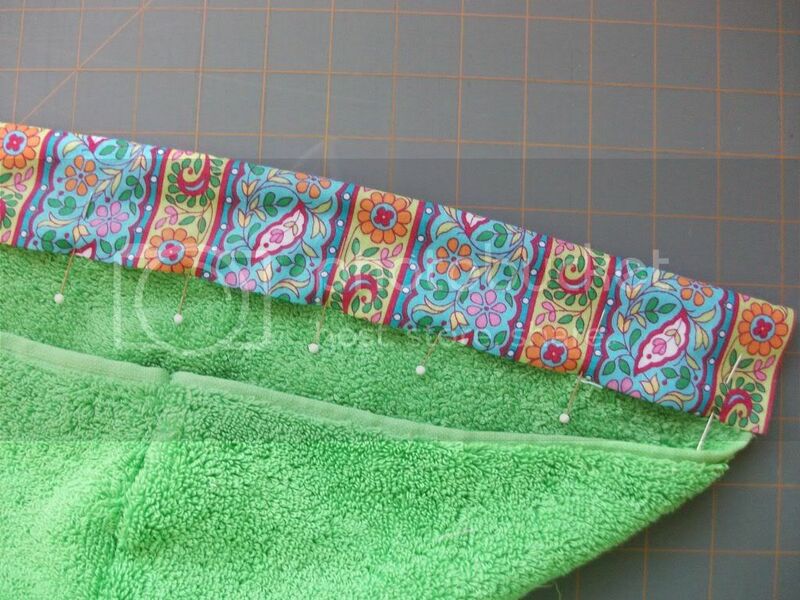 Fold fabric towards the inside so the ironed edge is along the stitching line on the inside of the hood. The seam should be tucked inside all of this. Pin it in place evenly. I pin it pretty well. Flip the whole thing over. You are going to top stitch along the top so the part that is seen will look straight and neat. It will catch the underside as you sew. Do not take out the pins until you are about to sew over them. This will help keep the bottom side right where you want it until it is sewn down. This picture shows the outside. I forgot to take a picture of the inside, but it looks similar. 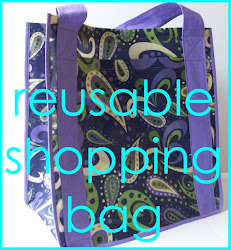 Tuck the little edges into the fabric "tube" you just made. I zig zagged mine down just to keep it all securely tucked away. 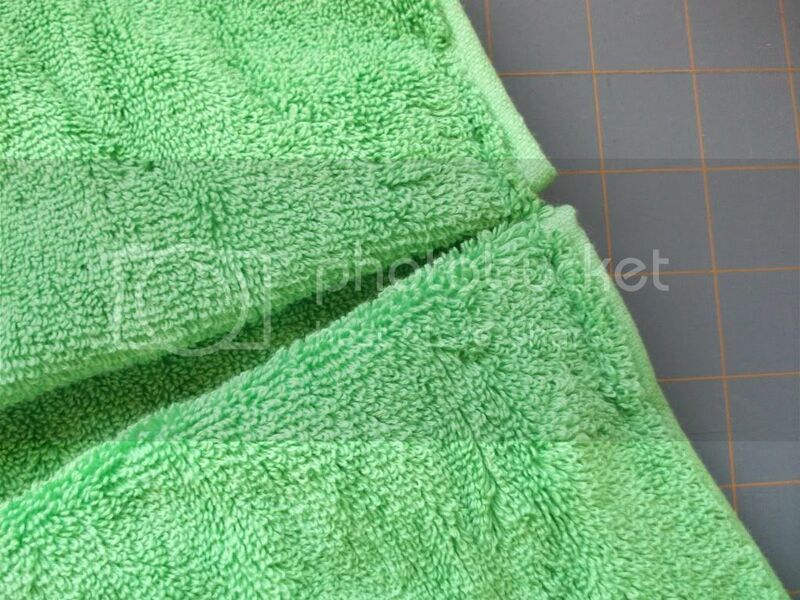 To make a pleat, mark the center of the towel. I just fold it in half (along the length) and put a pin in to mark the center. 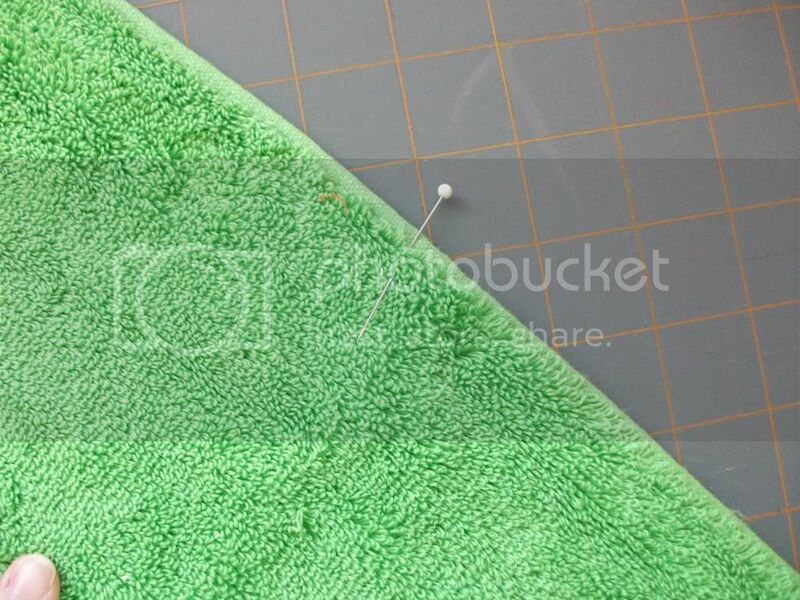 Bring about an inch of fabric from the left over to the center where it is pinned. 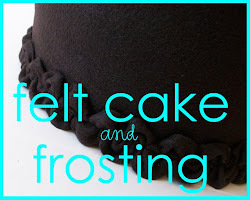 Lay the fold flat by smoothing the rest back towards the left and pin it in place. Do this on the right side as well. 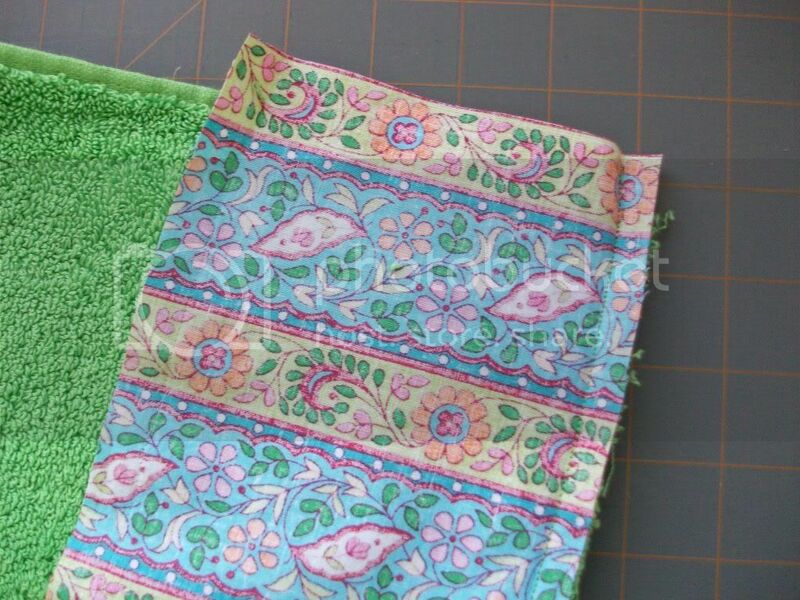 Pin well--the towel is so thick that the pleat has a tendency to move around as you sew. 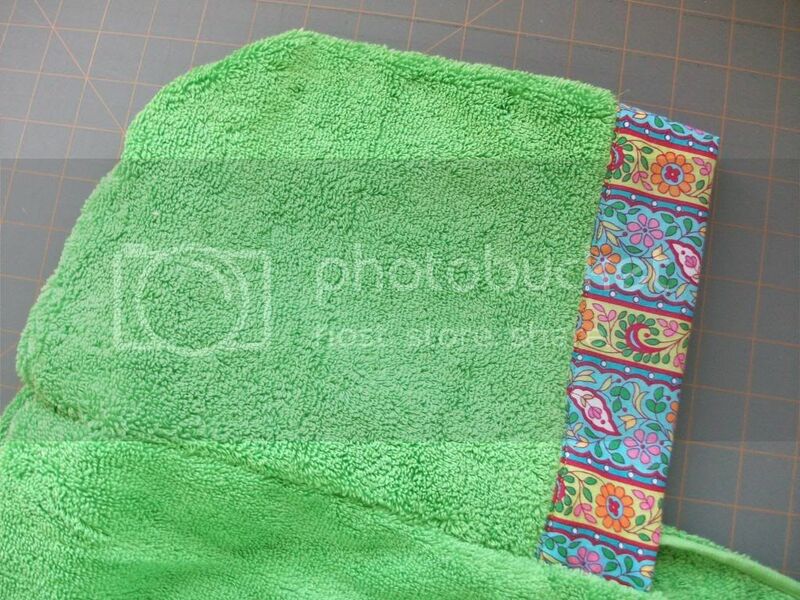 Baste (sew using a long stitch) the pleat in place along the top edge of the towel. 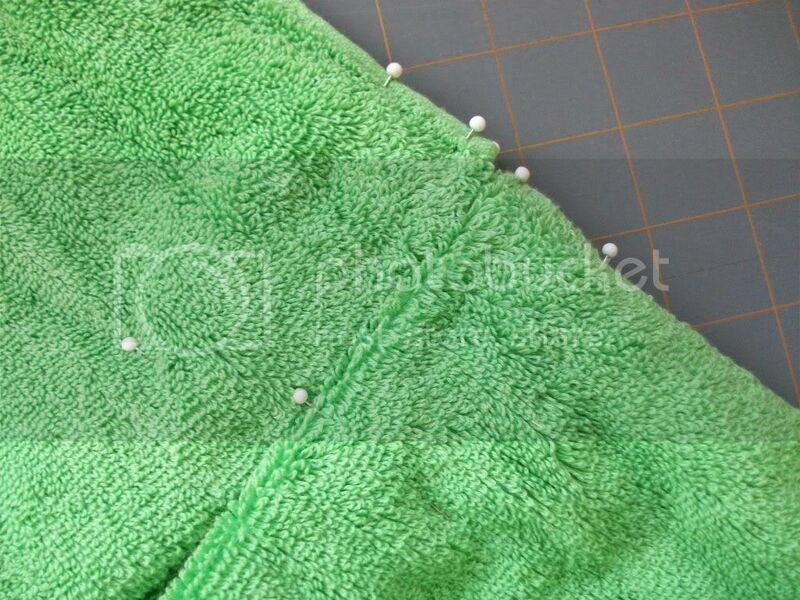 It is far easier to sew the hood to the towel if the pleat is already sewn down. The picture on the right is the same as the left. I just added a little "help" to the right one to help you see this better. You're almost done--you just need to attach the hood to the towel. 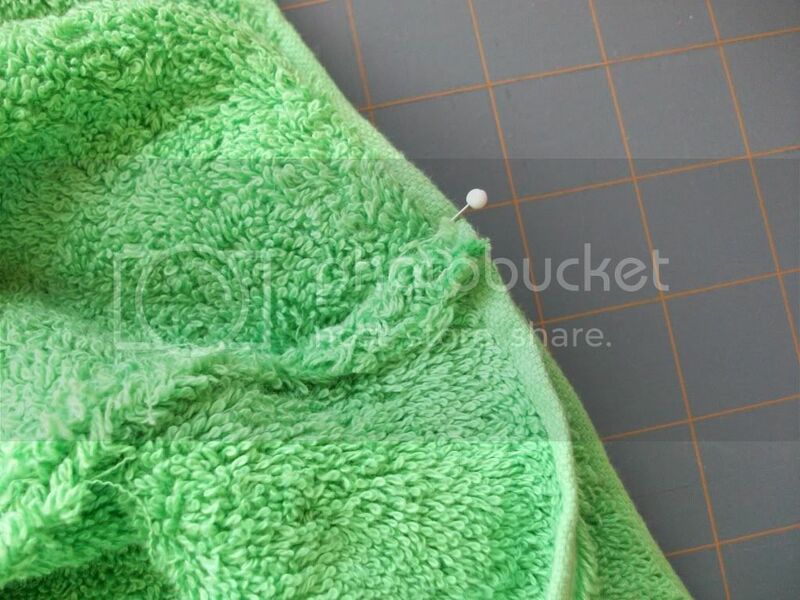 Place the center of the hood on the center of the towel. You want the outside of the hood (right side) to face the outside of the pleat (right side) of the towel. Pin in place. Sew the edges together. Start at the edge of the hood and sew down to the end of the edge on the other side of your hood. If it was on your body, you are basically sewing from one shoulder behind your head and along your neck to the other shoulder. It was too lumped together to get a good picture so I am hoping this makes sense. Not sure if you noticed, but I haven't finished a project for the last two weeks. YIKES! This gives me one for this week and I have one for next week almost done--whew! A woman from my church does this and I am astounded at the simplicity of such a great project. 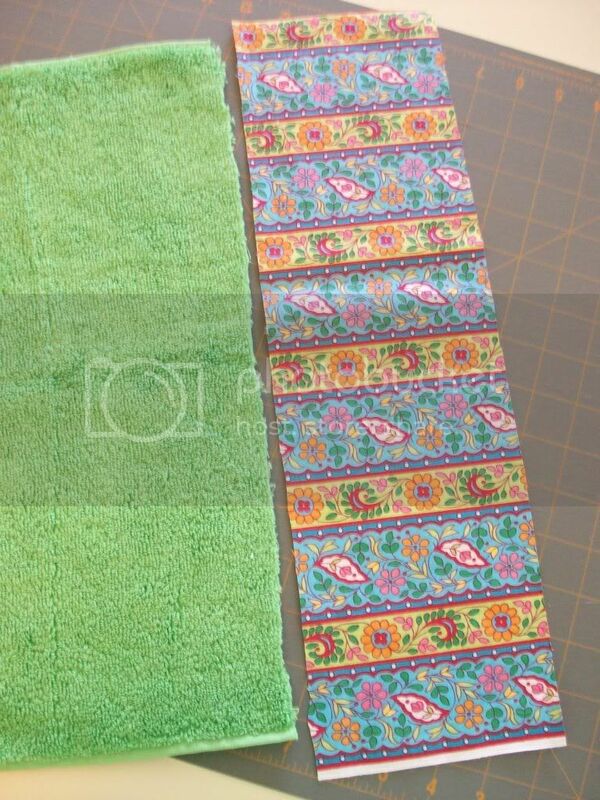 I love the fabric you chose on the green one. 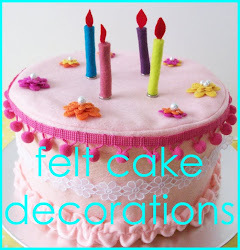 It is my fave and I hope you have one in your Etsy shop that I am anxiously waiting for. Oh, and how weird is it that i am always first to post a comment and seem to be on here when you are. I promise I am not a "she wears flowers" stalker. I would have loved this towel when I was little. I used to always put a separate towel over my head and play superhero after bathtime! Hmmmmm maybe I can make a grown up version? hee hee hee! 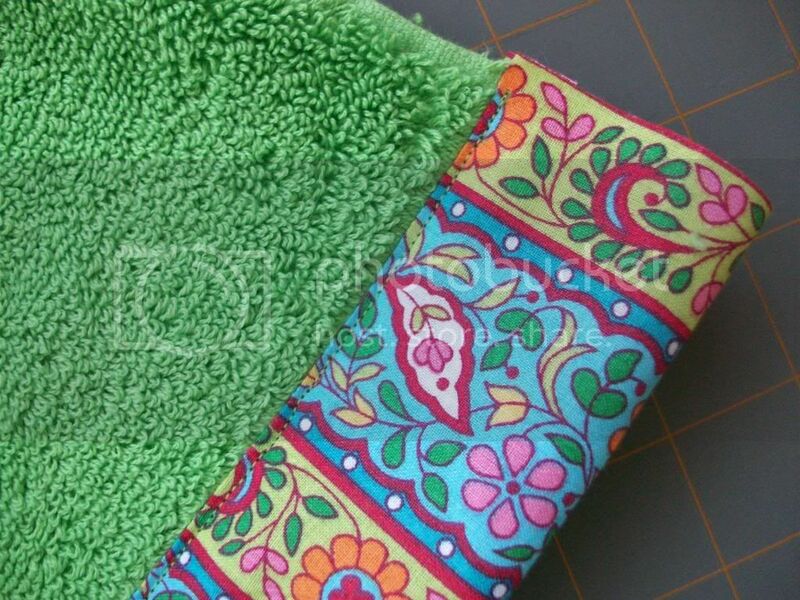 I love the colors you chose for the towels. I like the ribbon and the fabric edge! Good Thinkin'! This is too cute! I love the fabric around the hood! 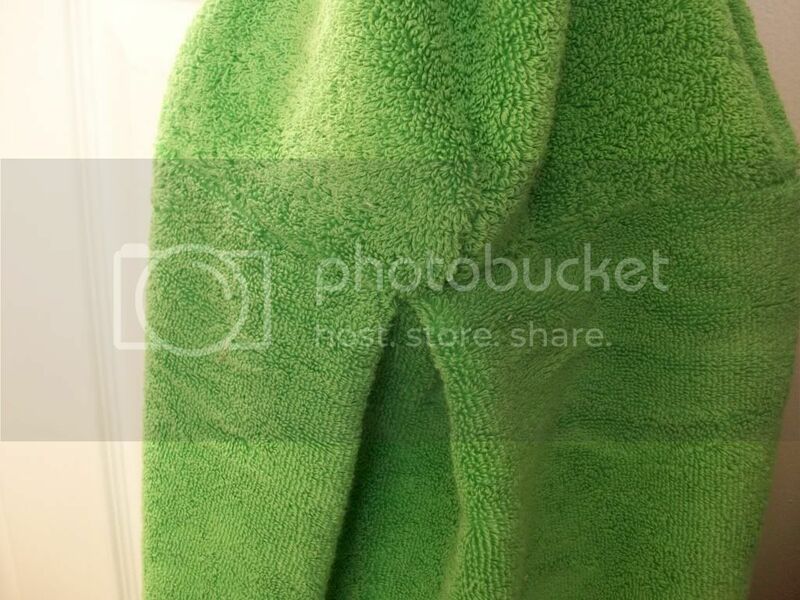 I had a hooded towel when I was a kid that I absolutely loved. Thanks for posting this tutorial. How do you cut it Ito thirds and have a big enough hood? It doesn't take as much fabric as you might think to make the hood. Plus, you are adding to the size with your fabric edge. If you are worried the hood will be too small, you can always use half of a hand towel.